I could read the significance of this card in several ways. I'm choosing to view it as being about my need to be my own person and not follow all the arbitrary rules of life. Another potential reading is about walking away from X as he is a very traditional person and for a while I kept getting this card when asking about him. I'm realizing that a lot of the guidance I got at this time in my life was so meaningful as it came right before my 50th birthday and the cards were really encouraging me to be my own person and to live my own life. 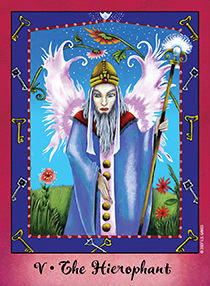 This is another card that is all about being your own person and not following the same path that everyone else has followed. This has always been hard for me, because I like to be liked and sometimes I will live according to other people's rules until I can't take it any longer and lash out. That always surprises everyone because they assumed that I was fine with the way things are going. One of my goals for this year is to live a more authentic life and to be more true to myself and stop living according t everyone else's rules.